This is now the only candy I make for the holidays. All others seem to be pale in comparison. In a heavy 3 quart sauce pan, melt butter. Add sugar and mix until well blended. Stir in corn syrup; cook until sugar has dissolved; remove pan from heat. Stir in sweetened condensed milk' cook over medium heat, stirring gently and constantly until mixture reaches the soft ball stage (240°) on a candy thermometer, about 20- 30 minutes. Add vanilla. Pour hot mixture into buttered pan. Cool. Use a spatula to remove from pan. 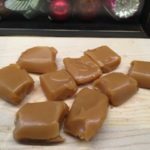 Cut into 36 caramel; wrap individually. I think you can now buy decorative candy wrappers either on line or in specialty kitchen shops. I happen to love the waxed paper approach...so authentically homemade. Where can I purchase fabric to complete my Safe Haven Quilt from a few years ago? Sorry, that fabric is long gone. Some have luck finding it on eBay from a quilter with extra fabric to sell. Hi Lynette, just found your new blog while searching for your Harvest Popcorn recipe. Could you please share it with me? I used to make it all the time and I miss it! I think the popcorn recipe was in the Cottage Comfort book. Would that help you find it? Oh my goodness, Lynette. I am never making these again (as I cross my fingers). These are the BEST caramels ever!! Best, best, best. Thank you for sharing your recipes, especially this one. Merry Christmas! I know…they are pretty addictive. Enjoy.